We are a company dedicated to hair. We love it! Our founder has been involved in the hair industry for over 20 years. 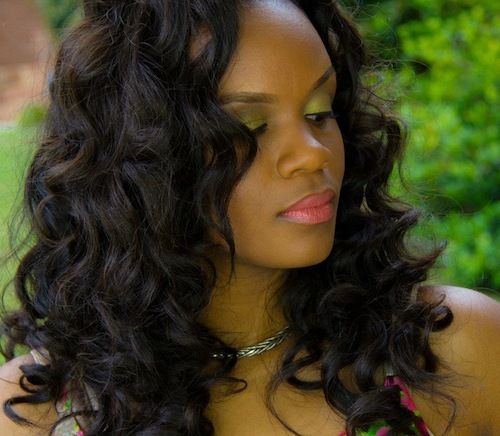 She has been a weave wearer, and researcher and has even formulated beauty products. Her passion is weave hair and natural hair health. She has researched and tested almost every type of hair on the market and has now resolved to work with 100% Imported Raw Hair from around the globe. Our hair is imported directly from overseas. We do not buy from a middle-man, or any US-based suppliers. WE DO NOT BUY CHINESE HAIR OR INDIAN HAIR. In the regions of the world where we purchase hair, there are many women who grow their hair long and sell their hair in exchange for money. We buy only the RAW PONYTAILS THAT WERE CUT DIRECTLY OFF OF THE DONOR'S HEAD- still in the rubber band that secured the ponytail pre-cutting! This hair is kept in its natural alignment (uni-directional or with cuticles lying in one direction); and is shipped to us in the US. Then, we carefully weft the hair and prep the hair to be shipped out to you. Unfortunately, what most hair manufacturers do is take valuable virgin hair, they do not keep it in lying in the same direction- then they throw it in a large vat along with animal hair, and acid wash it. This is incredibly damaging to the natural hair fiber. After this process, the human and animal hair is added to some synthetic fibers and processed to make the french refined, body wave, italian wave, and other beauty supply hair textures we all have purchased. The animal and synthetic fiber is added to the human hair (making the human hair stretch further). The hair is then coated with a type of silicone layer which makes the hair soft and shiny. This is a mandatory step because, now that the hair has been all mixed up in the acid bath, it is no longer lying root to tip. When the cuticles lie opposite each other, it causes friction and they tangle. That is why after a few washes of beauty supply hair the silicone layer is washed off and the hair begins to tangle, stick out at the base of your neck, and look unnatural. In recent years, many new options for processed hair have emerged. Even still, this treated hair will not last as long as Jace. Our Jace Fede virgin collection is far superior. Our Designed by Nature collection which is minimally processed is also superior. Actually, it's not even in the same category with beauty supply or lower-grade processed hair. This hair, with proper care, actually can last for years. Literally.